Larry Cragg Interview: "ALL THE YOUNG TUBES"
With all the questions about Neils Amp I thought I'd post this article from Guitar Player Mag. Mar./92 by Larry Cragg . Its a bit long so I'll have to post it in 2 parts. So for all those musicians and technicians out there this long notes for you. Larry Cragg began working with Neils on Neils guitars in 1972 and has toured as his tech since 1976. Larry has played banjo, pedal steel and sax for Neil and he's doubled on keyboards and guitars in Nils Lofgrens band since 1985. Neils played that black Les Paul since before I started working with him. He calls it Old Black, but its a 1953 gold top that used to have a trapeze bridge. Years ago he lost the bridge pickup for it, so they put in a Dearmond adjustable-pole pickup, like on an early Gretsch. He had that for about two years, and then he had me put in the chrome Firebird pickup thats been on there ever since. Its gotten beat up over the years and its very microphonic. You can talk into it, and it comes out just like a cheap microphone. it makes a lot of squeals. That Les Paul has had a Bigsby since I've been working for him. He wouldn't play another guitar until I finally found another 1953 Les Paul gold-top. I put in an old Firebird pickup and put that exact same kind of Bigsby on. His old guitar had chrome plates over the controls in the back, so I added those too, just to make it the same way. it sounds very similar, but the pickup is a lot more powerful and not as microphonic. It has its own sound. I'd say he used this guitar for half of Ragged Glory and half of Weld. Both guitars have the original frets. He doesn't like me to change anything. We don't go wireless. It just loses so much, because there's an interaction between the pickup and the first 12AX7 it sees. If you plug the pickup right into a transistor, which is what your doing with a wireless unit, and compounding it, for God's sake- it really fucks with the sound, especially when your completely on the edge like Neil. We use Beldon cable with 2 conductors in the middle- one for ground the other for hot. We can tell when there's not enough voltage, and when we go to Europe we have to have 60 cycles instead of 50, so we have a voltage generator that amplifies a clean sine wave until we get exactly 120 volts, 60 cycles, very clean. Neil can tell he says, " Well what do we have today, about 115 volts?" Sure enough, we do. He can hear that. He surprises me a lot with how much he really knows. You can't put anything past him. The first thing the signal always sees is the input of a Fender reverb unit. The reverb pan is not in the unit; its usually underneath the stage. This one happens to be more susceptible to vibration than other pans, but it has the tone he likes. he can tell when I try to substitute another reverb pan. Its really important to have the old style, funny shaped 6V6. Of course, that first 12AX7 is extremely important, and the reverb is rarely off. For his cleanest hottest signal, we have a loop bypass that makes his reverb unit go straight into the amplifier, a four input 1959 tweed Fender Deluxe. On top of the amp is a Whizzer, a device that physically turns the amp's knobs. Neil came up with the idea, and Sal Trentino, his amp tech, made the first one. This was a 2 position Whizzer that he used starting on Rust never Sleeps in 1978. The new one was made by Rick Davis in 1991. Its got four presets that completely control the three knobs on the top of the amp. He locks in the preset he wants, and it will always go back to that particular spot. We find that when you have the volume and tone all the way up, by turning that second volume knob up to about 10, it starts to fade away.But right before it starts to fade away, something else happens, and that has to be in exactly the right position. You can't breathe on it, or it fucks it all up. Here are Neil's Whizzer settings: For the highest volume, we have both the tone and the main volume on 12 and the second volume knob is at about 9.9. When it really compressed and breathing and screaming, that's whats going on. You can hear it on "Cortez". If we push it past 9.9 the sound goes away. The next button down moves his volume to 10, which just cleans it up. It's still broken up but its less garbled. The third button sets his volume on 6 with his that other volume still at 9.9 and the tone just down a little. The fourth preset moves one volume to 3,the other volume to 0, and backs the tone off a bit, its really bright and clean, almost country sounding. I have fans pumping a lot of air into the back of the Deluxe, since we rebiased the amp to use 6L6s. We have the speaker there, plus the extension speaker output, which has been significantly padded down with a volume knob. the signal then goes into Magnatone 280 stereo vibrato-the Lonnie Mack amp-with two 12s. Onstage, its inside the giant amplifier that's right behind Neils rig, along with a Baldwin Exterminator, a big tall amp made around 1971. Its got 2 15s, 2 12s and 2 8s, all in the same cabinet. Its transistorized and has a special sound that Neil likes. But basically he can't hear any of these amplifiers when he's standing onstage. They're history. Neil has his own private P.A and a Yamaha mixer. He has a separate microphone that's not connected to the house for each amp, and he can mix these to any level he wants. He mainly hears Deluxe, a lot of Baldwin, and very little Magnatone. Out front and on record, you can hear mostly Deluxe and Magnatone. Inside the big speaker cabinet to the audience's right are 2 two-way Maryland Sound P.A. cabinets with 2 15s and a horn apiece. These cabinets have 2000 watts of biamped power, and gets turned excruciatingly loud. It just kills me to go out there-I just about get knocked over. And that's what Neils hearing. This produces the feedback, and if we didn't have that on, the sound wouldn't be the same. Neil doesn't wear ear protection, and he's had a problem with that recently. I doubt if we'll be seeing this again soon. Right now he's gone into total acoustic. His main acoustics are a Martin D-45 that he got in 1967, a prewar D-18 and a D-28. I've installed stereo Fraps in each, which is by far the best way to amplify an acoustic guitar. I place two pickups inside the guitar-one for the top three strings and one for the bottom three. I do it real time while stringing up the top three strings . I have the pickup hot through a nice P.A. system,and I move it around. Placement is really critical-1/16th" can make or break it. When I'm done I have to set the guitar face down for a couple of days without moving it, because the slightest change affects it. 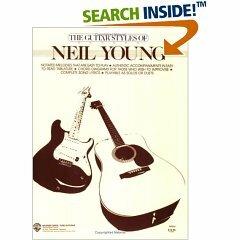 All together Neil has 45 or 50 guitars, including a real Explorer and a Flying V, a black Falcon, some more Les Pauls and some Gretsches, a few other Martins, his 12 strings are Taylors. Neil likes his strings to buss abit. I raised them on one of the acoustics by putting in a new saddle, and he didn't like that at all-made me put the old one back in. He uses regular light-gauge D"Angelico strings on the acoustics, Dean Markley .010-.046 SLPS on the electrics. Sometimes he tunes the low E down to D, and sometimes, like Cinnamon Girl he tunes both E's down to D. he calls this D modal, and he doesn't get any more radical with the tunings. He uses only gold Herco Picks, Flex 50s. If he uses anything heavier, he'll shred his strings. Also, see Neil Young Interview on Guitars and Equipment. 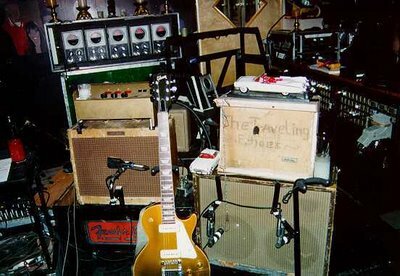 And see Plexi Palace - Vintage Amp Forums: Neil Young's amplifier discussion and Harmony Central Guitar Forum - What effects does Neil Young Use?.